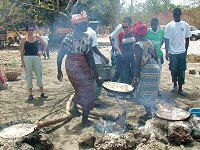 A wide variety of ethnic groups live in The Gambia with a minimum of intertribal friction, each preserving its own language and traditions. The Mandinka tribe is the largest, followed by the Fula, Wolof, Jola, and Serahuli. 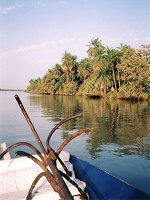 Approximately 2,500 non-Africans live in The Gambia, including Europeans and families of Lebanese origin. Muslims constitute more than 92% of the population. Christians of different denominations account for most of the remainder. 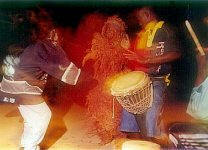 Gambians officially observe the holidays of both religions and practice religious tolerance. More than 80% of Gambians live in rural villages, although more and more young people come to the capital in search of work and education. While urban migration, development projects, and modernization are bringing more Gambians into contact with Western habits and values, the traditional emphasis on the extended family, as well as indigenous forms of dress and celebration, remain integral parts of everyday life. As many as 3 million slaves may have been taken from the region during the three centuries that the transatlantic slave trade operated. It is not known how many slaves were taken by Arab traders prior to and simultaneous with the transatlantic slave trade. Other Africans sold most of those taken to Europeans; some were prisoners of intertribal wars; some were sold because of unpaid debts, while others were kidnapped. Slaves were initially sent to Europe to work as servants until the market for labor expanded in the West Indies and North America in the 18th century. In 1807, slave trading was abolished throughout the British Empire, and the British tried unsuccessfully to end the slave traffic in The Gambia. They established the military post of Bathurst (now Banjul) in 1816. In the ensuing years, Banjul was at times under the jurisdiction of the British governor general in Sierra Leone. 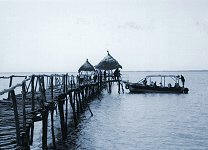 In 1888, The Gambia became a separate colonial entity. After World War II, the pace of constitutional reform quickened. Following general elections in 1962, full internal self-government was granted in 1963. The Gambia achieved independence on February 18, 1965, as a constitutional monarchy within the British Commonwealth. Shortly thereafter, the government proposed conversion from a monarchy to a republic with an elected president replacing the British monarch as chief of state. The proposal failed to receive the two-thirds majority required to amend the constitution, but the results won widespread attention abroad as testimony to The Gambia’s observance of secret balloting, honest elections, and civil rights and liberties. On April 24, 1970, The Gambia became a republic following a referendum. Until a military coup in July 1994, The Gambia was led by President Sir Dawda Kairaba Jawara, who was re-elected five times. The relative stability of the Jawara era was first broken by a violent, unsuccessful coup attempt in 1981. The coup was led by Kukoi Samba Sanyang, who, on two occasions, had unsuccessfully sought election to parliament. After a week of violence, which left several hundred dead, President Jawara, in London when the attack began, appealed to Senegal for help. Senegalese troops defeated the rebel force. In July 1994, the Armed Forces Provisional Ruling Council (AFPRC) seized power in a military coup d’etat, deposing the government of Sir Dawda Jawara. Lieutenant Yahya A.J.J. Jammeh, chairman of the AFPRC, became head of state. The AFPRC announced a transition plan for return to democratic civilian government. The Provisional Independent Electoral Commission (PIEC) was established in 1996 to conduct national elections. The transition process included the compilation of a new electoral register, adoption of a new constitution by referendum in August 1996, and presidential and legislative elections in September 1996 and January 1997, respectively. Foreign observers did not deem these elections free and fair. Retired Col. Yahya A.J.J. Jammeh was sworn into office as President of the Republic of The Gambia in November 1996. The PIEC was transformed to the Independent Electoral Commission (IEC) in 1997 and became responsible for registration of voters and conduct of elections and referenda. In late 2001 and early 2002, The Gambia completed a full cycle of presidential, legislative, and local elections, which foreign observers deemed free, fair, and transparent, albeit with some shortcomings. President Yahya Jammeh, who was re-elected, took the oath of office again on December 21, 2001. The APRC maintained its strong majority in the National Assembly. The Gambia followed a formal policy of nonalignment throughout most of former President Jawara’s tenure. It maintained close relations with the United Kingdom, Senegal, and other African countries. The July 1994 coup strained The Gambia’s relationship with Western powers, particularly the United States, which suspended most non-humanitarian assistance in accordance with Section 508 of the Foreign Assistance Act. Since 1995, President Jammeh has established diplomatic relations with several additional countries, including Libya, Taiwan, and Cuba. The Gambia plays an active role in international affairs, especially West African and Islamic affairs, although its representation abroad is limited. As a member of the Economic Community of West African States (ECOWAS), The Gambia has played an active role in that organization’s efforts to resolve the Liberian civil war and contributed troops to the community’s cease-fire monitoring group (ECOMOG) in 1990 and (ECOMIL) in 2003. It also has sought to mediate disputes in nearby Guinea-Bissau and the neighboring Casamance region of Senegal. U.S. policy seeks to build improved relations with The Gambia on the basis of historical ties, mutual respect, democratic rule, human rights, and adherence to UN resolutions on counter terrorism, conflict diamonds, and other forms of trafficking. Following The Gambia’s successful presidential and legislative elections in October 2001 and January 2002, respectively, the U.S. Government determined that a democratically elected government had assumed office and thus lifted the sanctions it had imposed against The Gambia in accordance with Section 508 of the Foreign Assistance Act as a result of the 1994 coup. U.S. assistance supports democracy, human rights, girls’ education, and the fight against HIV/AIDS. In addition, the Peace Corps maintains a large program with about 100 volunteers engaged in the environment, public health, and education sectors, mainly at the village level. Relations with the U.S. have improved significantly given the restoration of democratically elected government in 2001-2002, greater respect for human rights, and steadfast support of the War on Terrorism. The Gambia became eligible for preferential trade benefits under the African Growth and Opportunity Act (AGOA) on January 1, 2003.